Pfc. 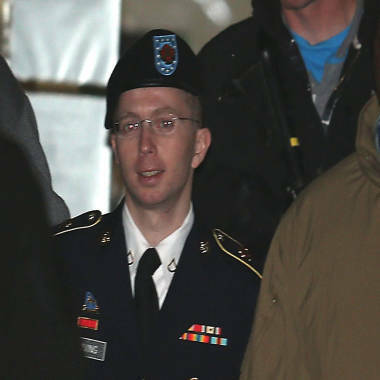 Bradley E. Manning is escorted from a pre-trial hearing Tuesday in Fort Meade, Maryland. Manning attended a motion hearing in the case of United States vs. Pfc. Bradley E. Manning, who is accused of sending hundreds of thousands of classified Iraq and Afghanistan war logs and more than 250,000 diplomatic cables to the website WikiLeaks while he was working as an intelligence analyst in Baghdad in 2009 and 2010. FORT MEADE, Md. -- During a pre-trial hearing Tuesday, the defense for Army Private First Class Bradley Manning -- accused of leaking thousands of classified documents to the website Wikileaks – began making the case that Manning's charges should be dismissed, saying the Army private's confinement conditions constitute illegal punishment. Pfc. Manning's defense team alleges he was improperly classified as a high security risk and as a risk to himself while confined at Quantico, which resulted in Manning being kept on 23-hour lockdown in a small cell. At one point, his clothes were taken from him at night. David Coombs, Manning's lead attorney, spent more than six hours questioning retired Marine Corps Col. Daniel Choike (pronounced CHOY-kee), who was commander of the Quantico brig at the time. Coombs asked Choike about a number of emails sent among the brig staff indicating that some at the facility believed that Manning did not require such harsh confinement. Judges can dismiss charges if treatment prior to trial is egregiously harsh, but it is rare. Manning's motion is filed under Article 13 of the Uniform Code of Military Justice, which bars any punishment or penalty other than arrest or confinement while the accused awaits trial. The brig staff classified Manning as maximum security, usually reserved for violent offenders, and as in need of protection from injury, a classification for prisoners who may harm themselves. The defense argues that Manning needed neither classification and that his status led to unfairly harsh confinement conditions. Just months before Manning entered the Quantico brig, another prisoner, Marine Captain Michael Webb, committed suicide while being held there. The defense's motion paints a picture of a base overly concerned about another suicide in the facility's brig, particularly with a prisoner as high profile as Manning. On the witness stand today, the brig's commander maintained that Manning's classifications as a maximum security prisoner and as a risk to himself were both proper, citing erratic behavior such as licking his cell's bars and playing peek-a-boo with brig staff. After nine months at Quantico, Manning was transferred to the Army prison at Fort Leavenworth, Kan., where he was placed in a medium security facility. He was not deemed a risk to himself. On Wednesday, the court is expected to hear from a member of the mental health staff at Quantico while Manning was there. Manning, who has never testified in detail himself, is listed as a witness but it is still unclear whether he will testify.